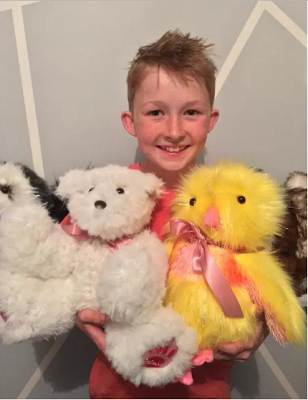 A 12 year old boy, Campbell Remess decided to learn how sew three years ago so he could make teddy bears for children in the hospital in need of comfort. 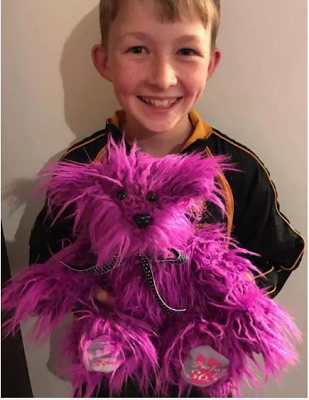 After he learnt how to sew at 9, Campbell began a project, 365, which is making one teddy bear a day for kids in the hospital. He uses is own sewing machine to make the beautiful teddy bears, names them before giving it out to kids at the local hospital near in his area. He has also made a teddy bear for his dad Nathan who was diagnosed with cancer last year. ‘Cancer gets worse with stress. ‘I made him the bear so he… so he could get rid of the cancer.’ he said to Feeds.